Rattlesnakes have an unusual way to scare away predators. When they rattle the hard, thick scales at the base of their tails, predators receive fair warning of a potentially deadly attack. Rattlesnake babies are born without rattles, but grow them within two weeks of birth, and continue to grow new rattles throughout their lifespans. Male rattlesnakes fight each other before mating with females. The Denver Zoo notes that a male wins the right to mate by entwining his body with another male and throwing the competitor to the ground. Rattlesnake eggs mature inside the mother’s body, rather than in a nest, with the gestation period being six to seven months. Female snakes give birth in the spring or summer and produce as many as 20 young snakes in a pregnancy. Female rattlesnakes usually become pregnant every two to three years, depending on the species. Hollow logs, crevices or other protected places are the locations of choice when a female rattlesnake gives birth to fully formed baby rattlesnakes. After one or two weeks, baby rattlesnakes begin to shed their skins for the first time and grow their first rattles. They venture off on their own and look for dens after they shed. Although the rattlesnakes are venomous at birth, life can be dangerous for baby snakes. They must avoid the animals and other snakes that view them as prey as they begin life on their own. Babies will reach maturity in about 3 years. Rattlesnakes live in a variety of habitats, ranging from meadows and swamps to the desert. Many rattlesnakes live in the southwestern part of the United States, although you’ll find them in North and South America. Temperatures are warm enough in the southwest U.S. so that hibernation is unnecessary. Snakes that live in colder climates hibernate during the coldest part of the winter and emerge again during the spring. 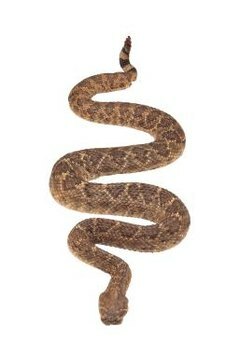 Rattlesnakes hunt at night and eat rodents, such as mice, rabbits, rats or squirrels. They locate food by sensing body heat from their potential prey through sensors on their heads. As the prey passes the snake’s hiding spot, it darts forward and injects venom into the animal with its fangs. Rattlesnakes scare predators away with a combination of hissing and shaking their rattles. Every time, a rattlesnake sheds, it grows one or more rattles to replace rattles that have fallen off. A rattlesnake can live 20 to 30 years in captivity, although those living in the wild don’t live as long, due to predators, accidents or disease, as noted on the DesertUSA website. Humans can pose a threat to rattlesnakes. People who don’t understand that rattlesnakes don’t attack unless threatened sometimes kill the snakes on sight. Development also is a threat to rattlesnakes, because construction of new housing developments and office buildings destroys prime rattlesnake habitats.